We cite these books as good examples of material on the scriptural and historical case for universalism. There is a variety to choose from to fit your preference, from a focus on theological, biblical, and historical scholarship, to more biographical personal journeys, or a combination. Don’t miss the “Old Classics” at the bottom! Founder of the Christian Universalist Association, Eric wrote this short introduction to Christian Universalism for a general audience. Eric forcefully argues for the Biblical teaching of universal salvation, responds to the most common objections, and provides a brief history of the CU faith. This book also serves as an overview of Christianity in general from a Universalist perspective, covering major theological themes. Endorsed by ministers from a diversity of denominations and backgrounds. A CUA leader from its founding, Kalen is a United Methodist minister who has traveled back and forth across the United States preaching and presenting the faith of Christian Universalism to groups and churches all over. 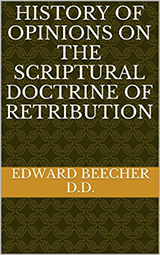 His book is an easy-to-read introduction to Christian Universalism, covering the major arguments for the salvation of all and refuting belief in eternal damnation. An Amazon reviewer was spot on with this tongue-in-cheek critique: “Julie has not been to seminary and therefore her message is rife with the ignorant heresies you would expect from a regular lay person with no formal training.” But in her book, Julie Ferwerda actually shows herself to be an excellent student of the Bible as she lays out her defense of Christian Universalism that sounds like she is talking to you across the dining room table. A fascinating journey of a group of disillusioned evangelicals and Catholics. 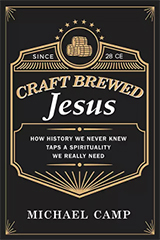 When they decide to meet regularly over craft beers to study the historic foundations of their faith, their findings both rock their world and resolve ancient mysteries. They uncover discoveries on how most of the early church fathers fully embraced or were sympathetic to universalism, how historical context helps us see original meaning in the NT, and what the meaning of judgment was according to Jesus (restorative not retributive). From the earliest days of the church, there have always been three views on what happens to those who die without knowing Christ…damnation, annihilation, and restoration. 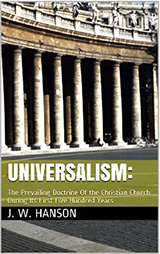 Patristic Universalism presents scriptural, philosophical, and historical support for the restoration view and demonstrates why it was the model advocated by some of the earliest and greatest church fathers. 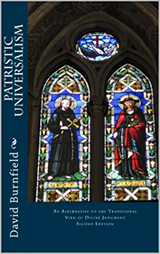 Anyone disillusioned with the traditional view that one must get it right in this life or spend eternity in hell will find Patristic Universalism an appealing alternative that remains true to Scripture. 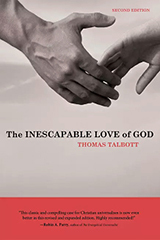 In this well-written book, Tom Talbott describes his theological journey on the way to embracing a belief in universal reconciliation, and sets forth a positive case that the New Testament clearly teaches universalism. 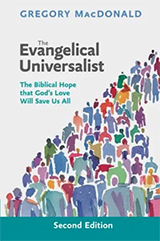 A significant theme that runs through this book is that, in contrast to Calvinism and Arminianism, according to universalism, God’s love is unlimited and God’s redemptive purposes are unthwarted as well. By Dr. Boyd C. Purcell, Ph.D.
Also a scholar of near-death experiences and Zoroastrianism, Ken Vincent here presents a strong argument for universal salvation, not only from the Bible, but also with evidence from mystical experience down through history and from NDEs. In September 2012, the feature-length documentary Hellbound? was released in theaters across North America. Joining a growing chorus of voices that were questioning the traditional view of hell as a place of eternal conscious torment, the film asked a handful of “burning” questions. Five years later… filmmaker Kevin Miller decided it was time to go back to some of the people who appear in Hellbound? and others he met along the way to get their input on how the debate has shifted and how it’s remained the same. The result is a plethora of voices offering all sorts of perspectives, some highly academic, some polemic, some intensely personal, and all bound to impact how readers think and feel about this issue. Gerry Beauchemin is a conservative evangelical Christian Universalist who wrote this book to lay out all the Biblical evidence for universal salvation in a compelling and convincing way. Especially helpful for Christians who take a rigorous, scripture-based approach to their faith. Can an orthodox Christian, committed to the historic faith of the Church and the authority of the Bible, be a universalist? Is it possible to believe that salvation is found only by grace, through faith in Christ, and yet to maintain that in the end all people will be saved? Can one believe passionately in mission if one does not think that anyone will be lost forever? Could universalism be consistent with the teachings of the Bible? This book argues that the answer is ‘yes’ to all of these questions. In Love Wins, bestselling author, international teacher, and speaker Rob Bell addresses one of the most controversial issues of faith—hell and the afterlife—arguing, would a loving God send people to eternal torment forever? 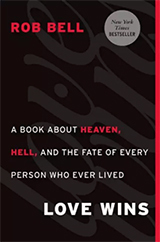 With searing insight, Bell puts hell on trial with a hopeful message—eternal life doesn’t start when we die; it starts right now. And ultimately, Love Wins. The idea of hell can haunt dreams and disturb sleep. Many wonder at the justice (or injustice) of it all, feeling confounded by a God who deems it necessary to send the majority of humanity to burn there forever. Seventy percent of Americans believe in hell, as do ninety-two percent of those who attend church every week. Clearly, it’s a hot topic. Baker offers readers a safe space to contemplate tough issues as they rethink traditional views of hell. 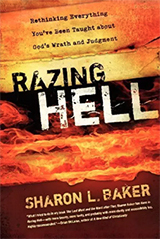 In her candid and inviting style Baker explores and ultimately refutes many traditional views of hell, presenting instead theologically sound ways of thinking that are more consistent with the image of God as a loving creator who desires to liberate us from sin and evil. Everlasting hell and divine judgment, a lake of fire and brimstone–these mainstays of evangelical tradition have come under fire once again in recent decades. Would the God of love revealed by Jesus really consign the vast majority of humankind to a destiny of eternal, conscious torment? Is divine mercy bound by the demands of justice? 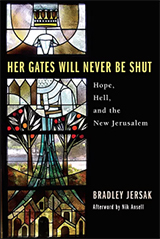 Jersak endeavors to reconsider what the Bible and the Church have actually said about hell and hope, noting a breadth of real possibilities that undermines every presumption. Fourth-generation fundamentalist Carlton Pearson, a Christian megastar and host, takes a courageous and controversial stand on religion that proposes a hell-less Christianity and a gospel of inclusion that calls for an end to local and worldwide conflicts and divisions along religious lines. 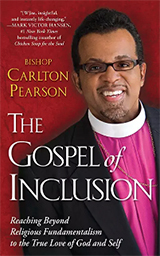 The Gospel of Inclusion explores the exclusionary doctrines in mainstream religion and concludes that according to the evidence of the Bible and irrefutable logic, they cannot be true. His story is also told in the film, Come Sunday. 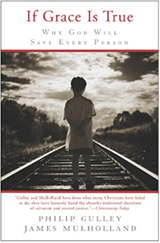 In this controversial bestseller, authors and Quaker ministers Philip Gulley and James Mulholland expand upon their belief in eternal salvation for all through God’s perfect grace. For seekers, for thoughtful Christians, and for the simply curious, Gulley and Mulholland offer a beautiful, timeless message of hope. The purpose of this book is to present some of the evidence of the prevalence in the early centuries of the Christian church, of the doctrine of the final holiness of all mankind. The author has endeavored to give the language of the early Christians, rather than to paraphrase their words, or state their sentiments in his own language. He has aimed to present irrefutable proofs that the doctrine of Universal Salvation was the prevalent sentiment of the primitive Christian church.